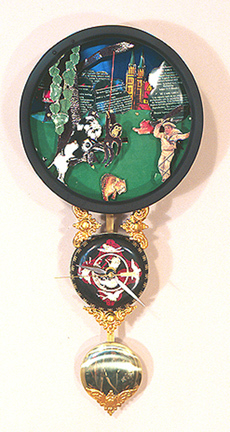 Many thanks to artist Randall Cleaver for contributing to the Tinblog. 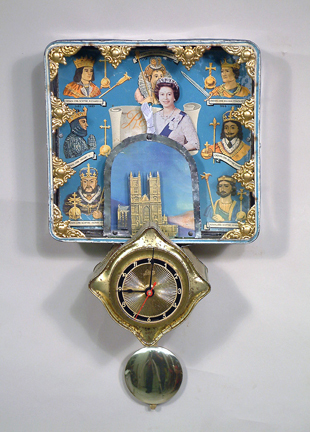 Randall uses many found objects and materials (including tinplate) in his meticulous work. 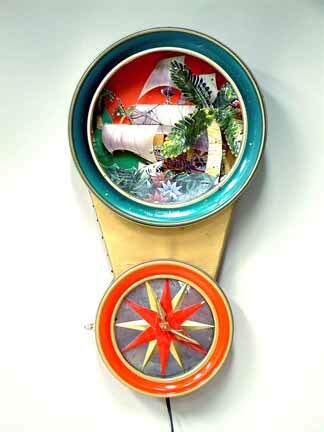 Included are what he calls “Story Clocks” where he uses imagery from the tins to tell part of a story. Read on for more! 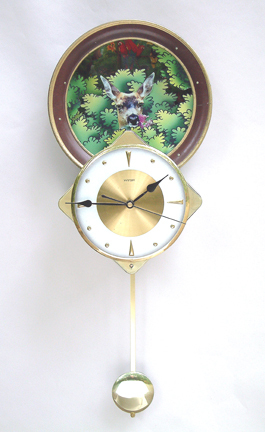 “I make clocks and lamps using found objects. 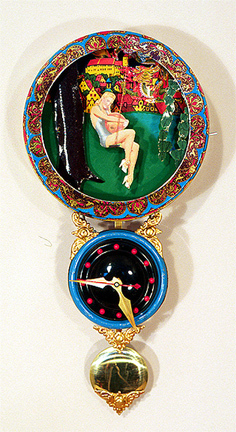 I have been using found objects since I graduated from college (I was a bio major but got seduced by art after taking a sculpture class). I had no access to a shop and had a few hand tools. So found objects were a way for me to continue making art. The parts were all ready made; I just had to assemble them. Even though I now have a shop I prefer to find the parts. 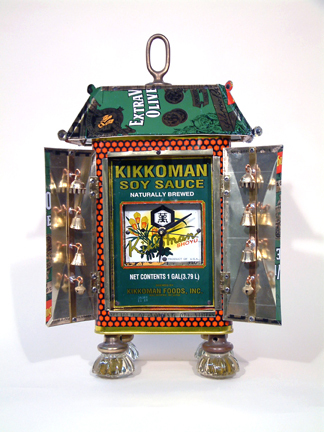 “Working in tin came about when Bobby Hansson (author of The Fine Art of the Tin Can) saw my slides in a gallery and called me asking if I used tin in any of my art. At the time I didn’t but I said I would start to play with it and see what I could come up with. So I went out and rummaged through the recycling buckets on the street looking for materials. Now years later I still frequently use tin as a material. I love the colors, textures and images on them. 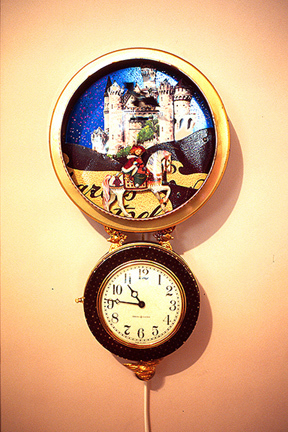 I use cookie tins as housing for my clocks and animation. 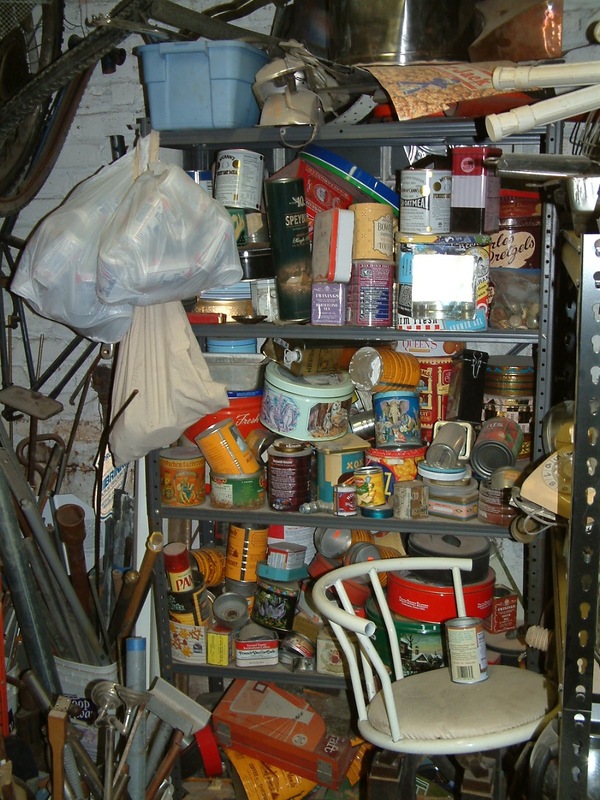 I find some tin in recycling cans and others at thrift stores. And friends will save interesting cans for me. I got a great mustard oil can from India that way. 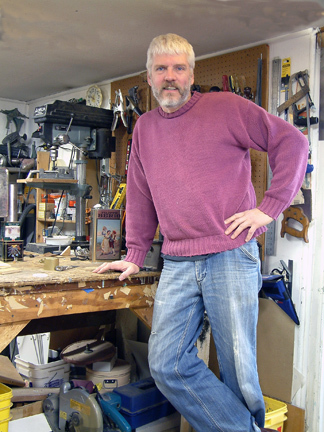 Randall Cleaver in his studio. Randall also sent along a photo of his can storage area. This familiar sight filled us with joy. 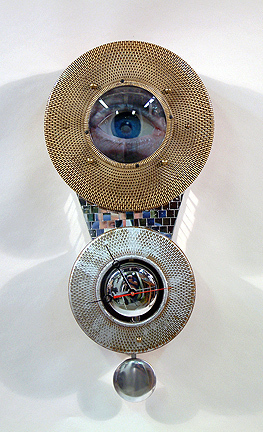 To see more of Randall Cleaver’s work, check out his website, www.randallcleaver.com. Thank you so much, Randall! 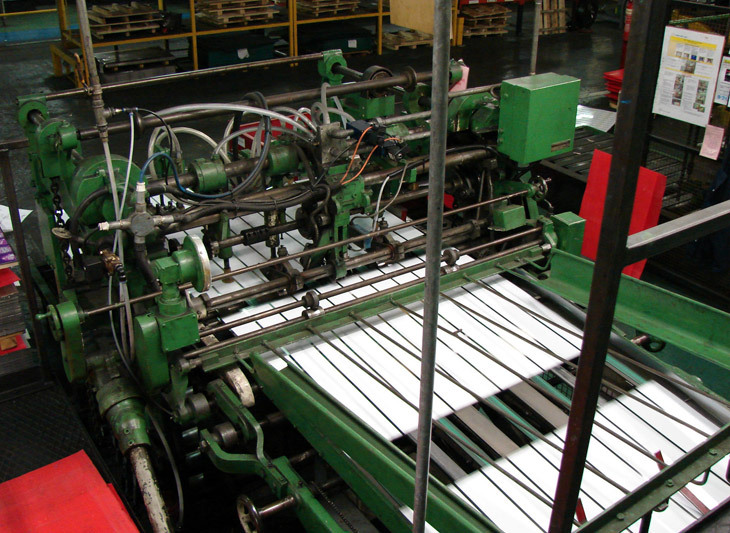 “Tin printing in our industry is actually the same as normal offset, sheet-fed lithographic printing. There are a couple of subtle differences however. 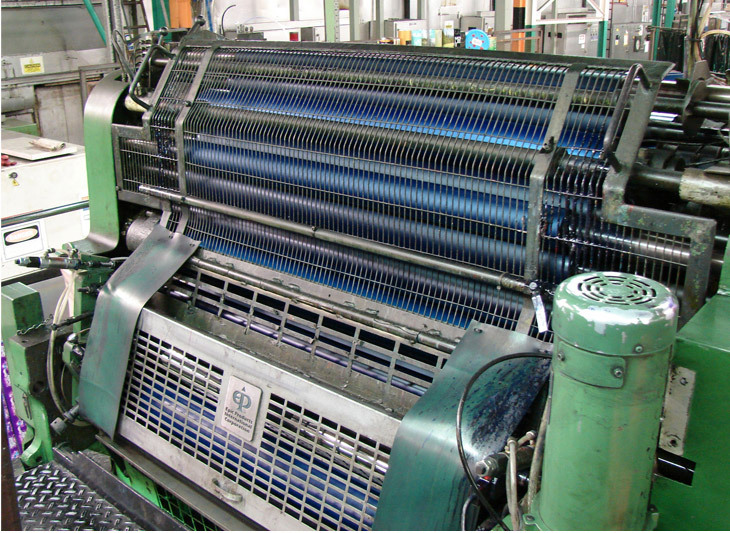 The ink train is relatively small, with fewer rollers than a paper press. 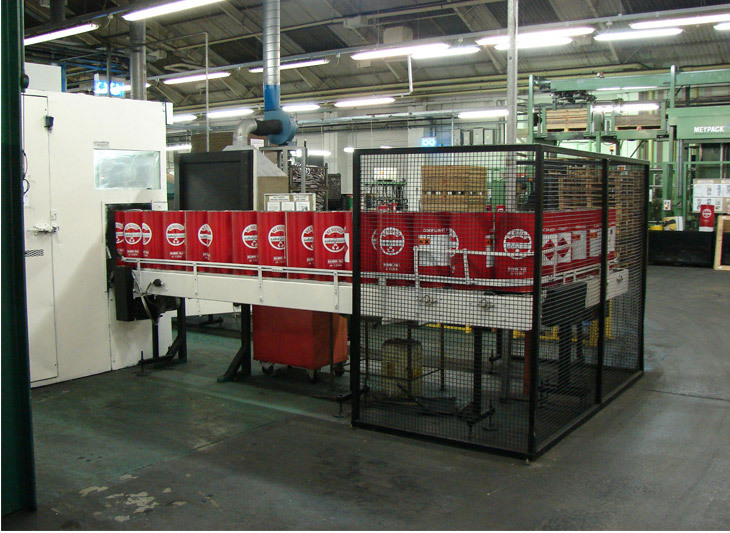 This is to minimise the number of sheets through the press to make a change in ink-film thickness. 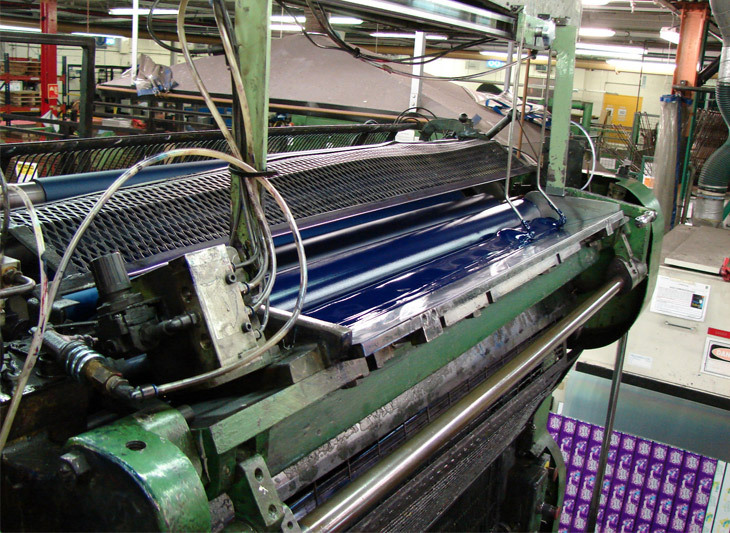 “The other difference is that the three cylinders (plate, blanket, and impression) are always arranged vertically so the tinplate does not have to bend when being printed, so the sheet of tinplate goes straight through. 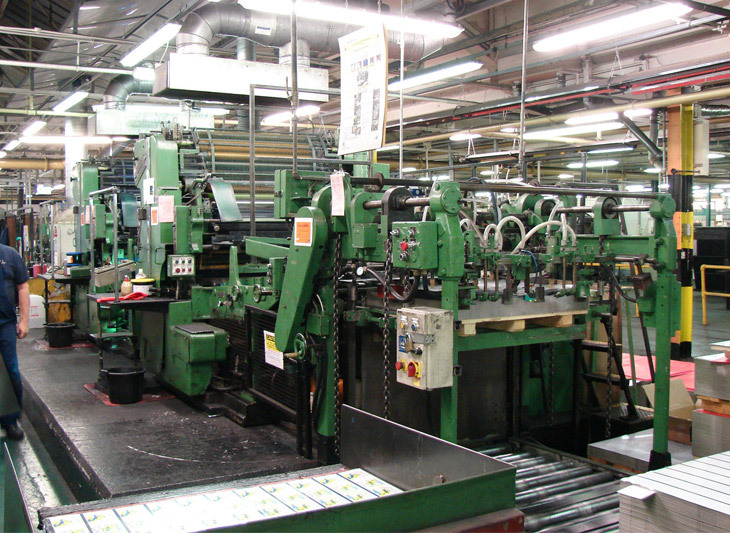 With many paper presses, the impression cylinder is pushed back toward the rear of the press and the sheet curves around it before either being printed on another deck or into the sheet delivery. 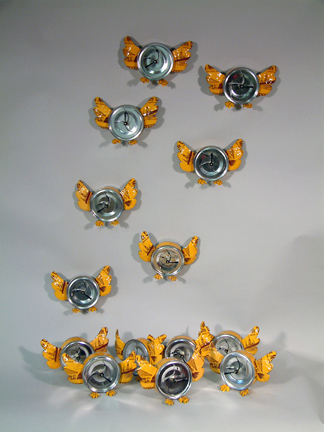 “The press is arranged in a U shape. 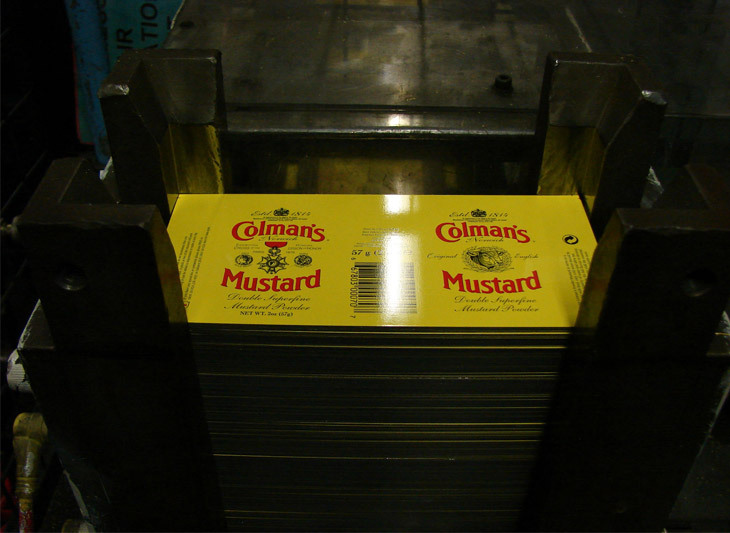 The sheets are fed into the first printing deck where the first colour is applied. 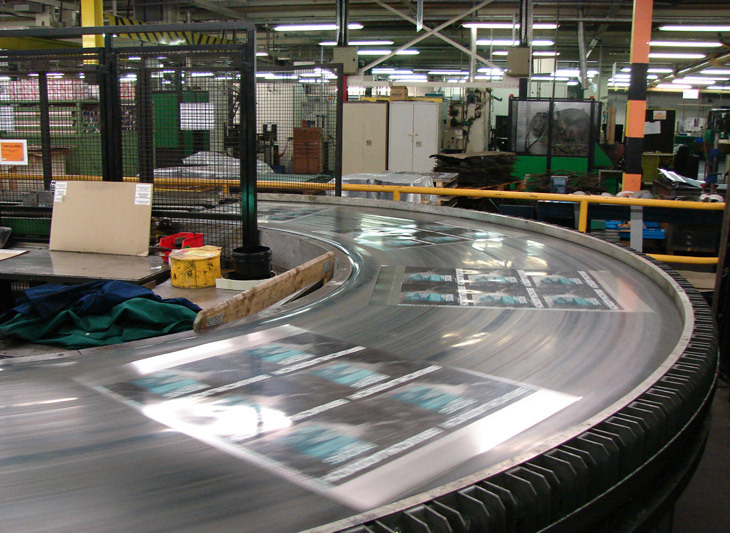 The sheet is then transferred on moving tapes to the second printing deck. 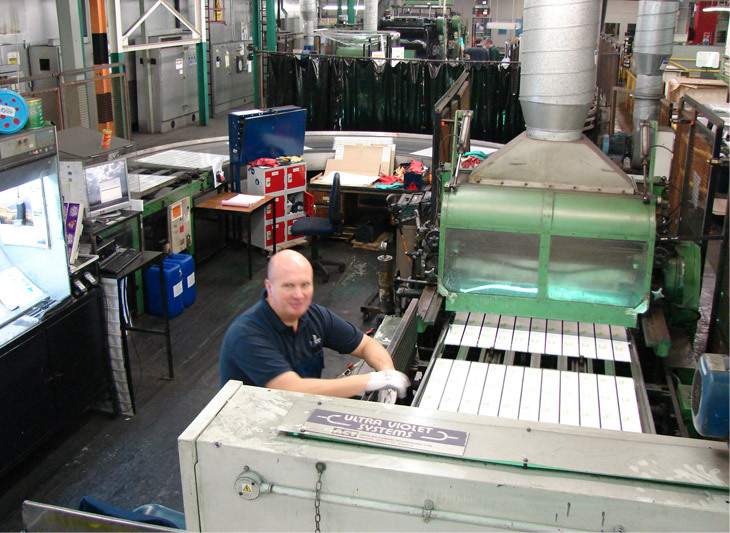 The sheet goes under U/V lamps to dry the ink before it goes into the varnish unit. “The sheet then goes around the U bend & under the U/V lamps to dry the varnish. The varnish has to lie for a few moments before it is cured. Finally the sheet is delivered into the end box. Thanks again to Keith for all the great photos and information! 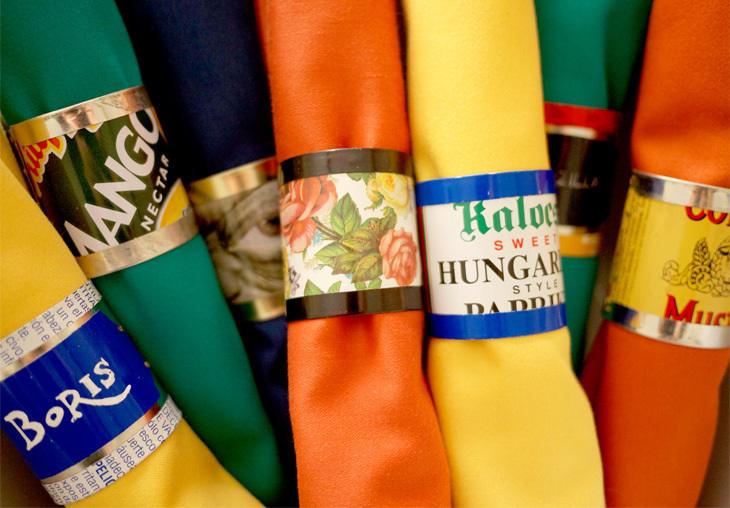 We, here at Tinplate Girl, are excited to share with you our newest project, napkin rings! And just in time to get cooking on some Thanksgiving decor. These napkin rings can add a punch of color, as well as a nice handmade touch to your table, no matter how fancy or informal your gathering. Another new thing we’ve done with this project is we’ve made a video preview. We made a commercial! You can view it below. We are very excited to share the work and words of incredible French artist Dominique Corbin. 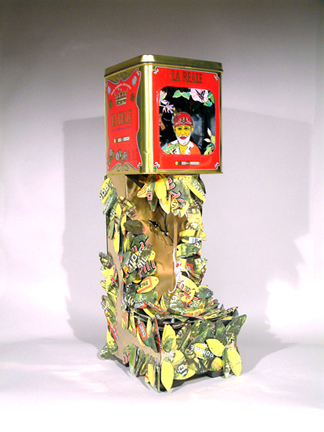 Dominique has been working with tinplate for 40 years and many of his recent works are automata, constructed of tinplate, wood, and other materials. 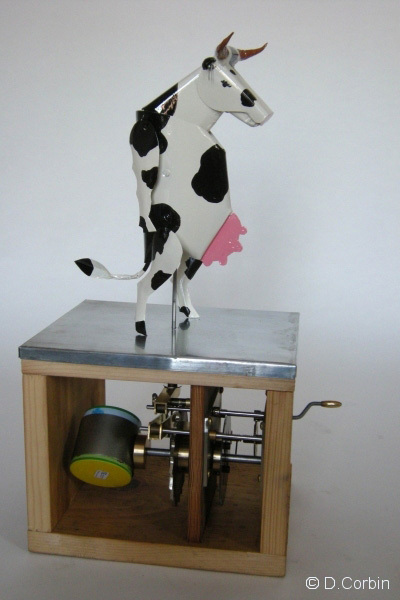 At the end of this post is a link to his website, which includes a great blog and video gallery of his automata. We hope you enjoy this interview and will check out his site as well! TG: How long have you been creating things with your hands? DC: As long as I can remember. I started very young by destroying things like radio receivers, mechanical toys, electrical appliances (I ran into a lot of trouble with my parents!) and building with their elements a fantastic universe where I can travel, by the power of imagination. I also built toys, like a dollhouse for my sister in a little cabinet, with light and water. Things like that. TG: What is your educational and professional background? DC: I studied physics at the university. (Now I’ve forgotten everything!) A long time ago I was a scientist searching for renewable energies, but it was not in fashion at that time, so I quit, discouraged. I had a lot of different jobs before becoming a special-effects technician in the movie industry, which I have done for the last 25 years. 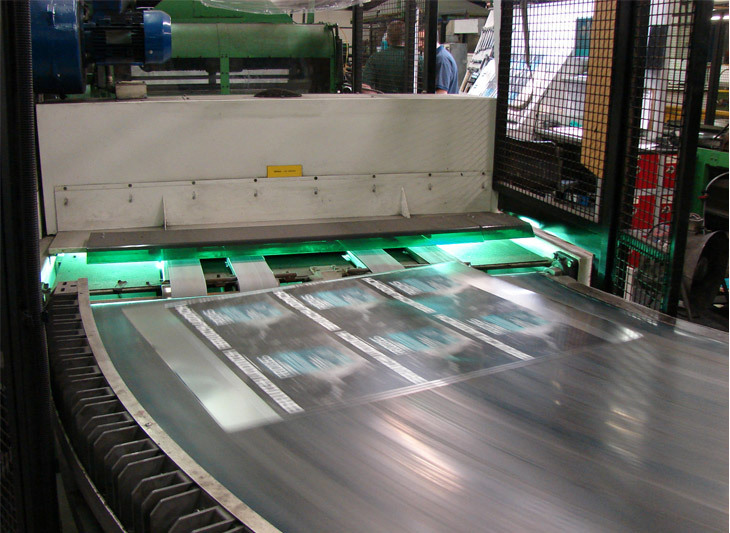 TG: When and why did you start working with tinplate and sheet metal? DC: When I was in college, I developed a passion for electronics. I had a soldering iron and discovered the power of tinplate building! First I used it to build quick and dirty prototypes of any kind, before discovering its artistic side, building studies of automatas. TG: How extensive is your workshop? 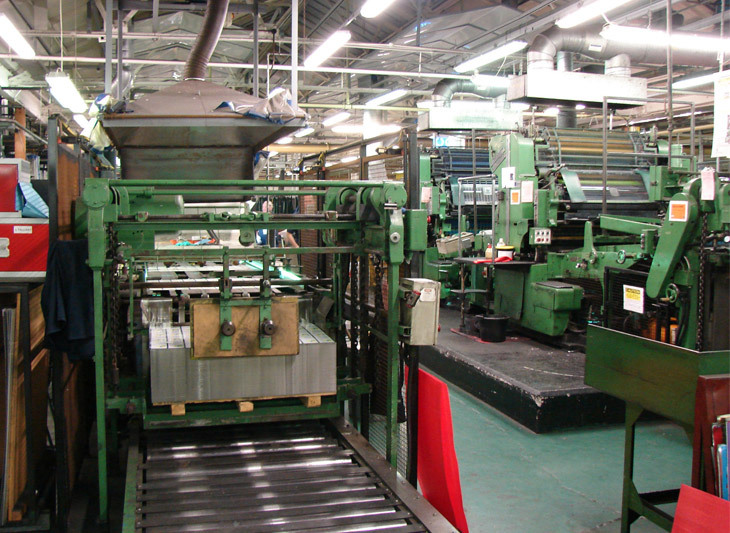 Do you have machine tools (lathe, mill, etc.)? DC: Two thirds of my house is devoted to different workshops, with an electronics lab, machine tools for wood and metal, etc…manual work is my job anyway! TG: What is your favorite tool? DC: Maybe my Leatherman tool! I always carry one. TG: When did you start making automata and what attracted you to them? DC: I started when I was 25, because I just love woodcarving and mechanics, so it looks evident! TG: What inspires you the most in your work? 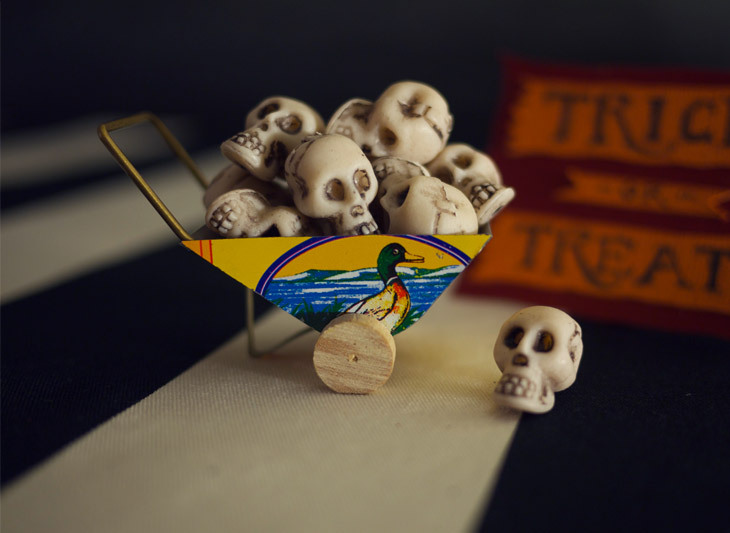 DC: Old toys of any sort, papercraft, old illustrations, old books on mechanics. TG: What advice do you have for anyone just starting to work with tinplate? DC: Go crazy! 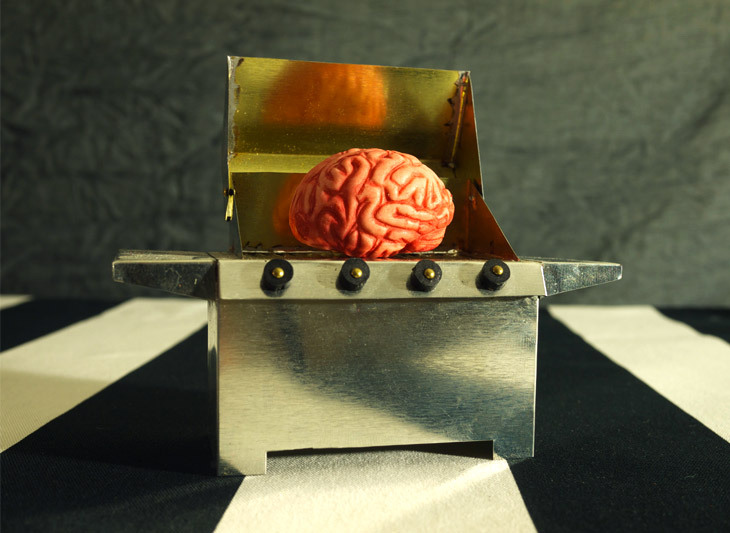 Don’t hesitate to create what comes into your mind! Dominique, thank you so much for your time. We can’t wait to see what you do next! 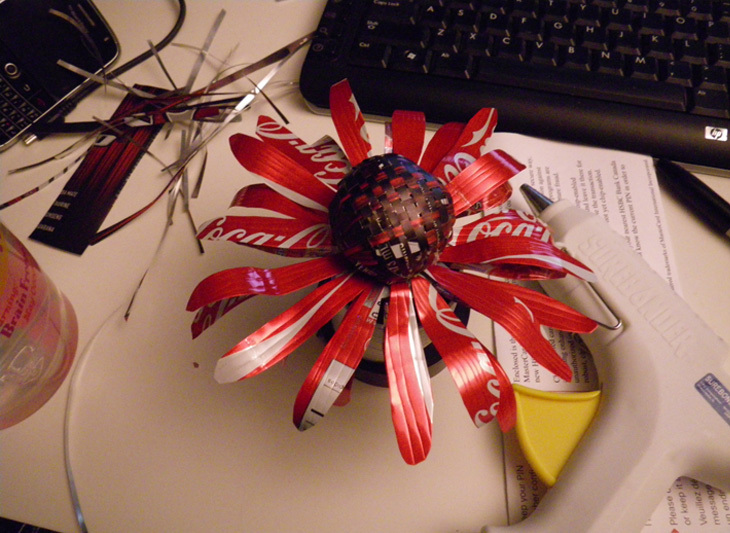 Thanks to Joey Chan for writing in to share the great pop-can Echinacea he made. 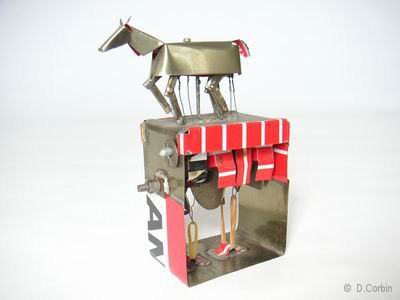 Although aluminum cans can’t be soldered, many of the shaping and forming techniques he used can work for tinplate. Joey used pop cans from the recycling bin at his work. He chose them by the colors he wanted, used scissors to cut them, and hot glue to hold the pieces. He wove the cones and debossed lines into the leaves and petals. 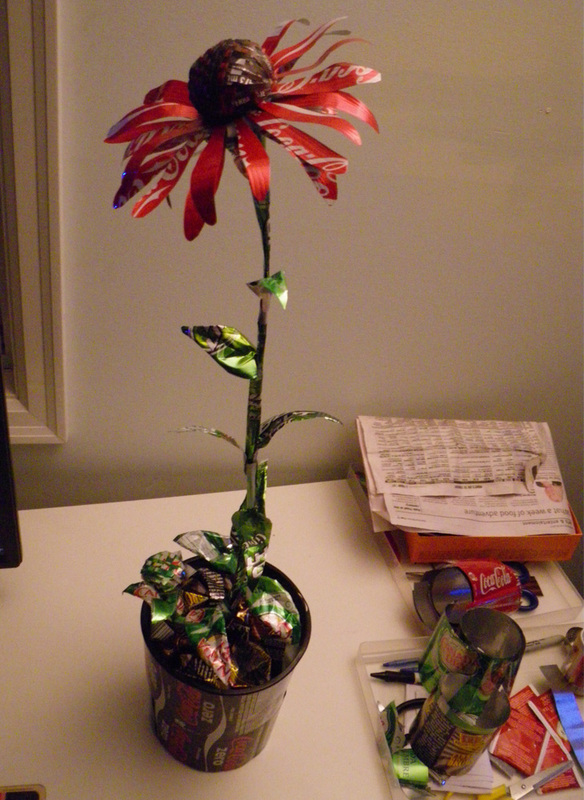 He wrapped strips around a wire for the stems, and even wrapped the pot with more flattened cans. Many thanks to reader Michael Mott who wrote in with concerns about fingers and drill presses. 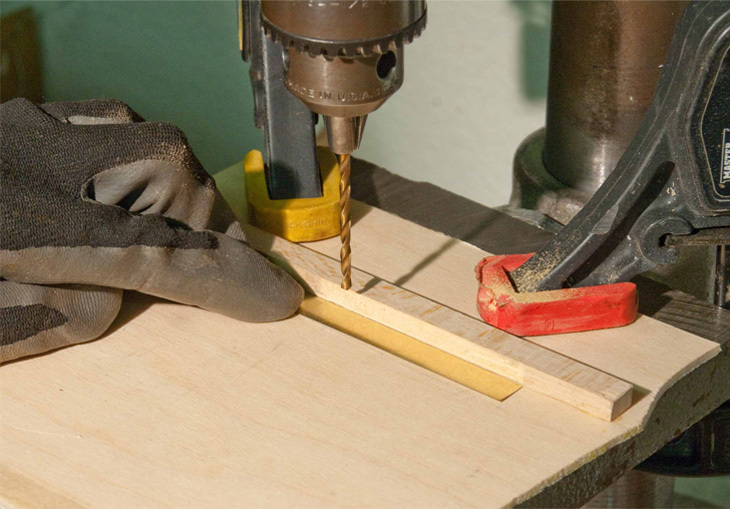 He writes, “The drillpress is the most underestimated power tool in the workshop, even a small drill bit has a lot of strength and torque.” Drill bits can easily catch the metal work and whip it around before you know it. If you do decide to hold your work with your hands, please wear good work gloves. There are lots of proprietary and fancy drill press clamps out there, and if you’ve got ’em, great. We don’t have any of those, so below are some ideas of how to get the same results using other types of clamps that you may already have around. The first one is only recommended for drilling small holes. 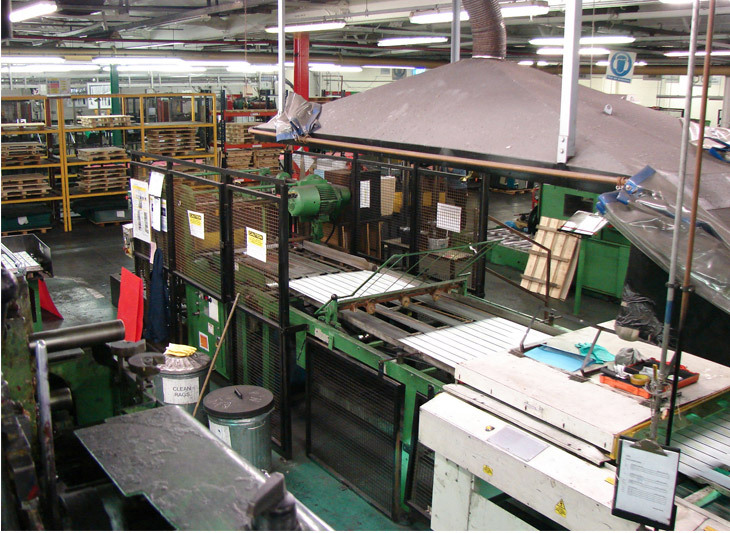 This shows spring clamps holding a flat sheet of tinplate to the table, with a backer board to prevent too much distortion from the bit pushing through the metal. The next two photos show a setup for a larger drill bit or step bit. There are two one-handed bar clamps holding a sheet of tinplate directly to the table (use a backer if not using a step bit). This setup is exactly the same as you would use with C-clamps. There are blocks of wood inside the clamp jaws on both sides of the table. Drill press tables are all recessed on the underside, so placing small blocks of wood underneath creates a stable surface to clamp to. The second photo shows the blocks of wood on the underside of the table. 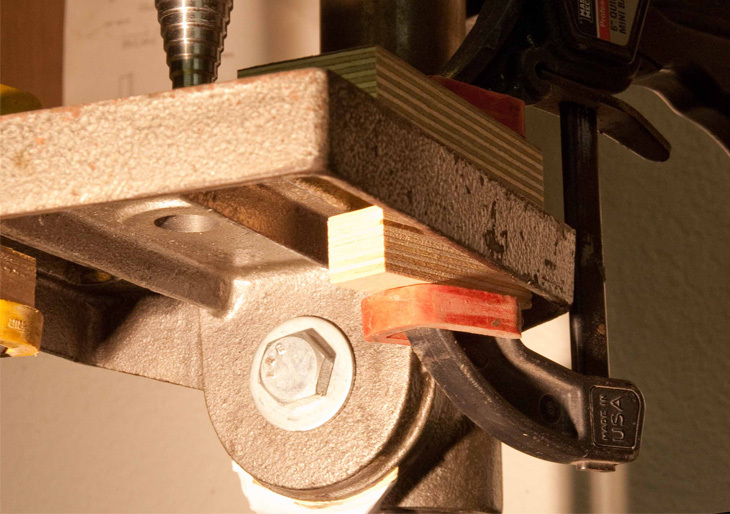 The blocks of wood on the top are used to avoid marring the surface of your work, especially if using C-clamps. 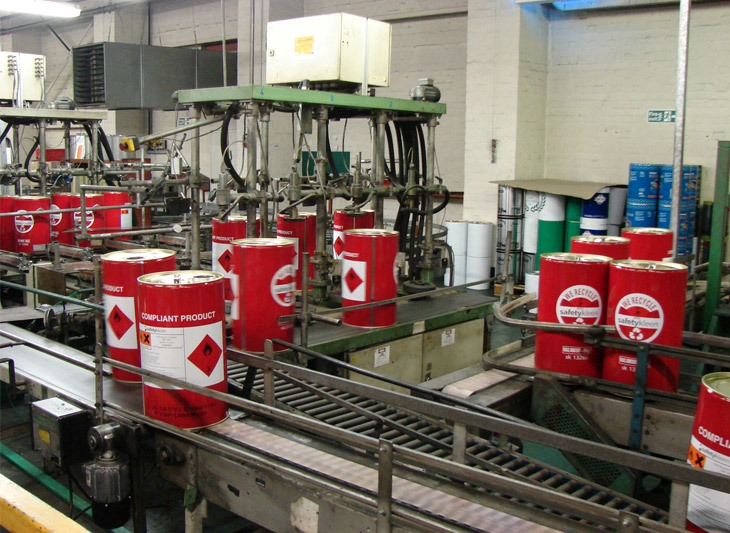 The last photo here shows a stopper-bar setup. 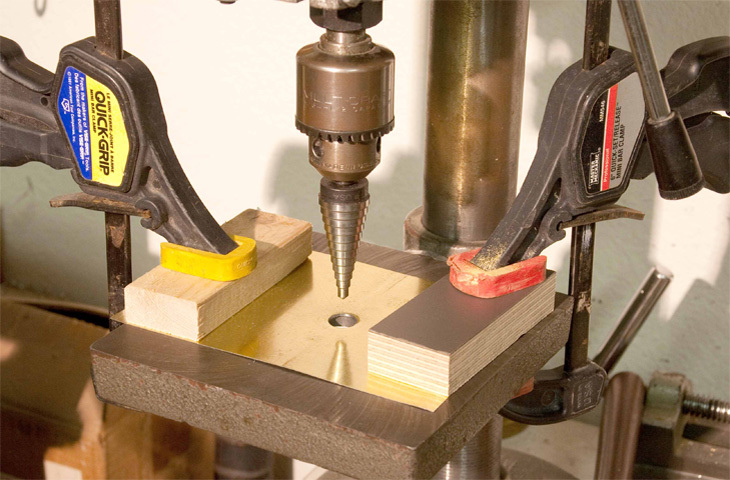 This is used to drill into work that is too small or awkward to clamp. The idea here is to hold your work firmly against the stopper-bar, so if the drill bit were to catch the metal, the work would be stopped from spinning by the stopper. 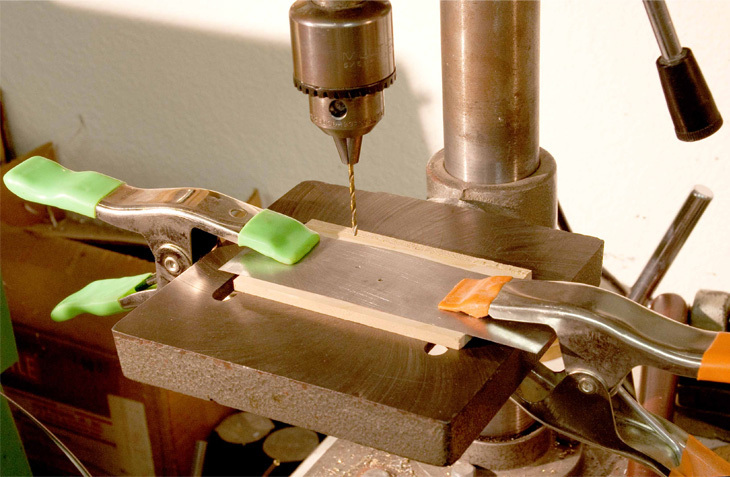 This example is just a strip of wood glued to a flat backer, then clamped down to the table. 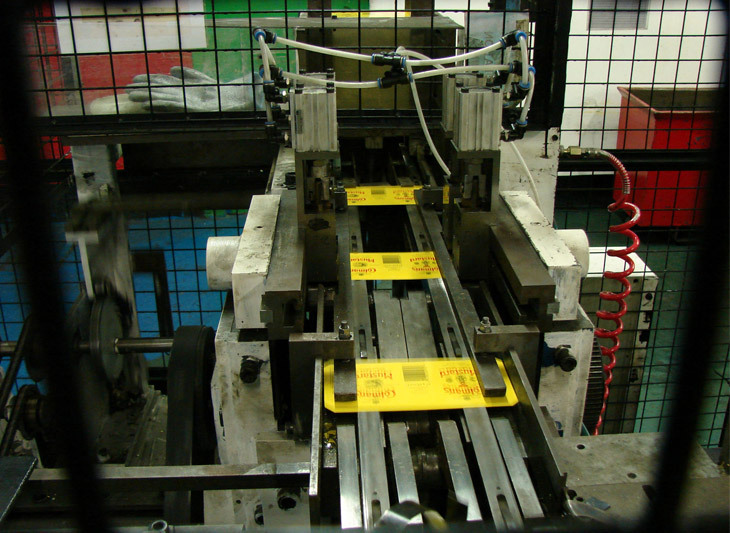 If you’ve got more clamping ideas, please leave a comment! 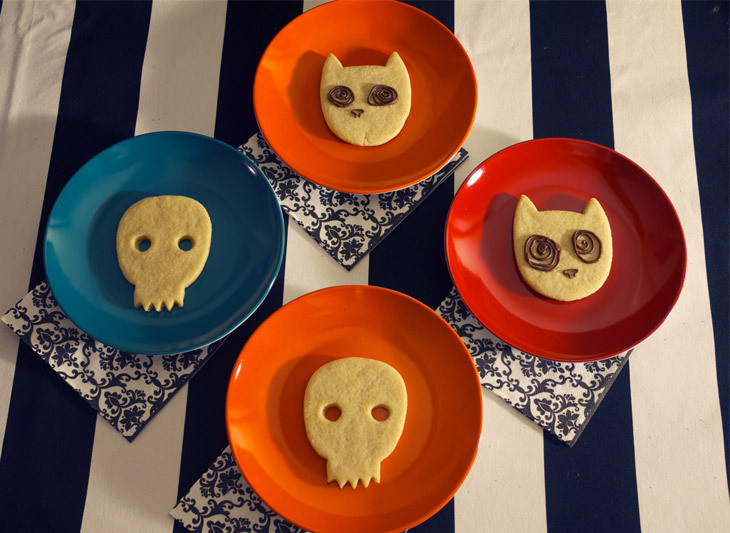 I don’t know about you, but when I think of tinplate and Halloween, I think of costumes. However, this year we do not have a costume project to offer you, but don’t let that stop you from making your own! 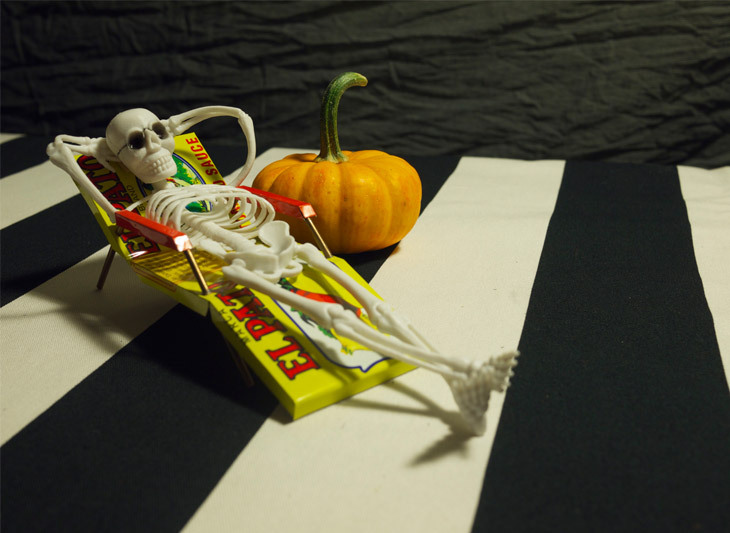 What we do have is a variety of projects that, with the right setting or addition, work quite splendidly as Halloween decorations. Our Featured Project this month is Six shovels. 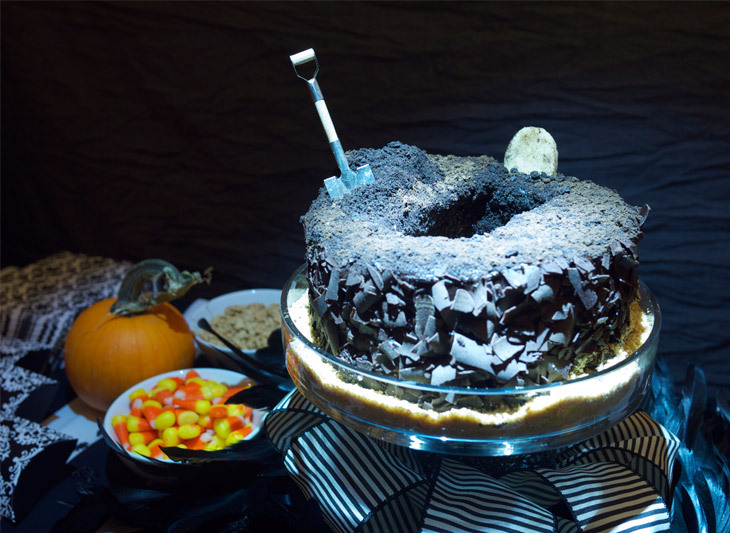 I’ve decided to stick the spade in a chocolate cake with a shallow grave. We’ve been cranking away in our spare time for two years to create this website and all of its content, and we are super pumped to finally share it with the world! Now that we’ve got all the technical building-a-website nitty-gritty out of the way, we’re itching to get back into the workshop and start developing more sweet projects. 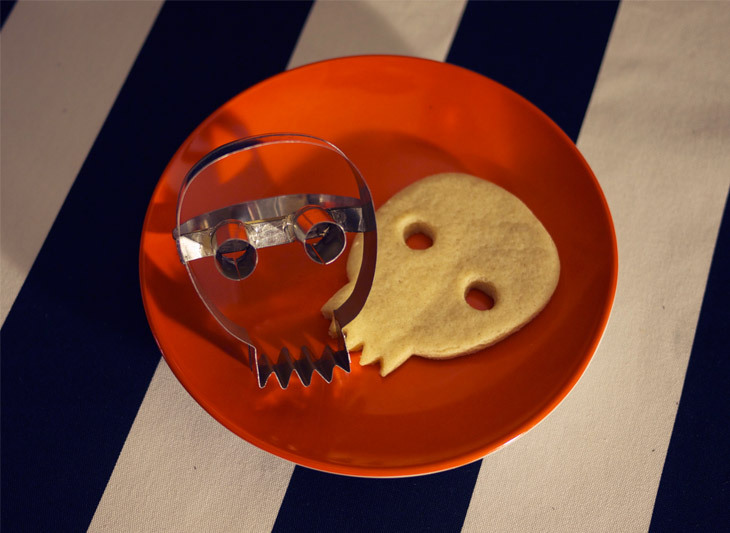 Stay tuned, we’ve also got Halloween on the braaaaaiinsssss!